Invasive plants are non-native plants that have been introduced to British Columbia where we lack the insect predators and plant pathogens that help keep them in check in their native habitats. They are the second greatest threat to global biodiversity, after habitat destruction. These plants out-compete native vegetation and spread quickly if left untreated. They destroy food sources and take over important habitats for native plants and animals. Some are even hazardous to human health. Invasive plants are not permitted for planting on municipal boulevards. There are 19 species identified in the District’s Invasive Plants Strategy to target for management and control in West Vancouver. This invasive can reach heights of five metres or more. Its large bracts of white flowers bloom in summer. Giant hogweed leaves are very large and have coarse, jagged edges. The hollow stalks have purple blotches with streaks or spots and stiff hairs. Hogweed is typically found on riverbanks and along roadways but is opportunistic and will grow where it can. Giant hogweed should only be removed by a professional due to its toxicity. If you remove it yourself, do so when it’s young, before it flowers. Wear goggles, gloves and protective clothing. Cut the root crown three to four inches below the soil surface. Double-bag it and place it in the garbage. Never compost hogweed; this plant is dangerous to humans. Once it flowers, you should contact a professional to avoid spreading the seeds. Risks to human health: If hogweed sap comes in contact with skin, it can cause extreme dermatitis in the presence of sunlight that can lead to scarring, rashes and blistering. The sap can also cause temporary or permanent blindness if it gets into the eyes. If the sap gets on your skin, wash the affected area thoroughly with soap and water. Keep the affected area out of the sun, and treat it as you would a surface burn. Japanese knotweed is a bamboo-like plant with heart-shaped leaves and long, hollow stems. It easily reaches heights of one to five metres and grows showy plumes of small green-white flowers off the stem and leaf joints. It can grow just about anywhere, including in waste sites, meadows and wooded areas, as well as along roadways and stream banks. Knotweed spreads quickly and is often found in tall, dense thickets. Thickets of Japanese knotweed can sprout from a small piece of root or stem. If you see knotweed, it’s best not to dig it up and risk spreading it; call for professional help instead. 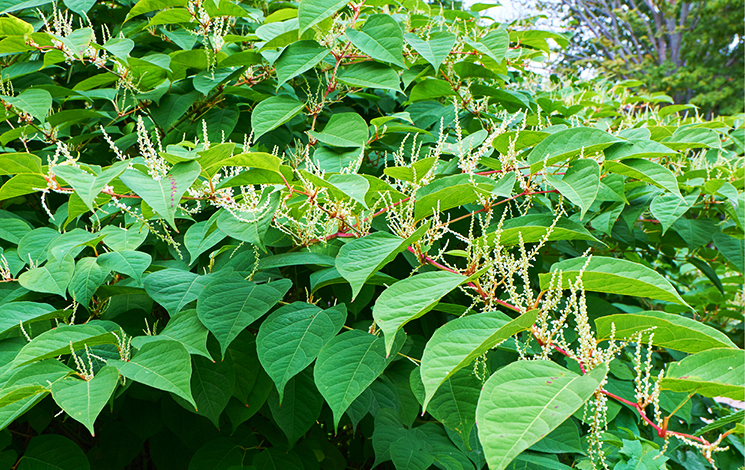 Although herbicides and pesticides are largely banned in West Vancouver, knotweed should be treated by a professional using pesticide application. If you have knotweed on your property, contact a professional with a current BC Pesticide Applicator Certificate who can apply for an exemption from the District’s herbicide ban. Most licenced landscape businesses can assist homeowners in this regard. The exemption application process is simple and free. Don’t dump garden waste. Dispose of all your garden waste and hanging baskets—including soil, dead plants and clippings—either into your compost or yard trimmings collection (except for Knotweed and Giant Hogweed, which require special attention and care). Check out the brochure to the right for more information on these two invasives. Keep your plants under control and choose them wisely. If you have fast spreading invasives like ivy or lamium, please keep them cut back and contained. Better yet, don’t plant them in the first place. Instead, choose native plants. Help us control the spread. For removal of hogweed and knotweed, it is strongly recommended that you hire a professional. For information on specific plant removal and proper disposal methods, please visit the Invasive Species Council of Metro Vancouver. You can also call the Parks Department at 604-925-PARK (7275) to find out more about invasive plants in West Vancouver. Council created the Invasive Plants Working Group to develop a five-year strategy to manage and control invasive plants in West Vancouver. The draft strategy was approved by Council June 16, 2014.